Runner Michael Murray, swimmers Leslie Cichocki and Sarah Gilbert and runners/rowers Bruce & Mark Worley round out a strong performance for the US Team. Washington, DC – Six elite athletes with intellectual disability represented the United States at the INAS Global Games World Championships in Italy from September 24 – October 3. Nearly 700 athletes from 40 countries competed in swimming, athletics, tennis, basketball, indoor soccer, cycling, and table tennis. The Global Games are a major preparatory competition for the London 2012 Paralympic Games where for the first time since 2000 people with intellectual disability will be compete in swimming, table tennis, and athletics. 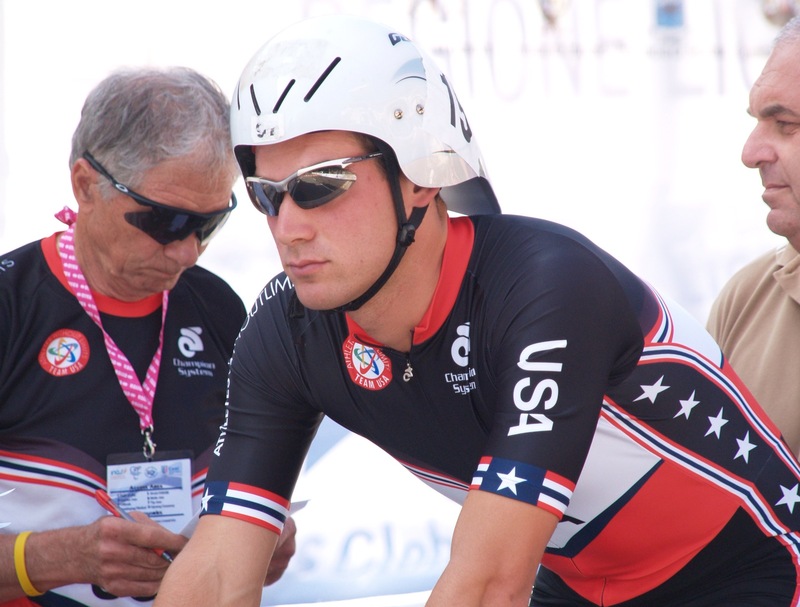 2011 INAS Cycling World Champion Syd Lea at the start of his gold medal time trial. Michael Murray warms up for the men’s 800m final where he placed 4th in heartbreaking a photo finish. In the individual time trial Lea dominated the race with a winning margin of more than 50 seconds. Dalibor Havelka of the Czech Republic and Andre Penedo were finished second and third respectively. While the US didn’t garner any other medals, it continued the theme of firsts by athletes earning places in the finals of swimming and track and field. Michael Murray, just 20 years old from Nashville, TN competed in the 1500, 800, and 400 meter runs, making the finals of the 800 and 400. Murray finished 5th in the 400 and 4th in a photo finish between 2nd, 3rd, and 4th places in the 800. In both events he record personal best times. Murray will again represent his country as a member of the US Paralympic team competing at the ParaPan Games November, 14-18 in Guadalaraja, Mexico. 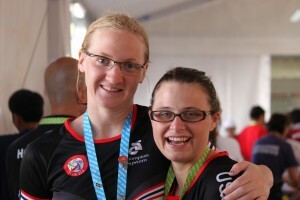 US Teammates Leslie Cichocki & Sarah Gilbert support each other between events during the 4-day swim competition. Swimmer Leslie Cichocki also had an excellent first international meet competing in 10 different events over four days setting six new personal bests, posting six top 10 times, qualifying for three finals, and setting a new American record in the 50 backstroke (39.44). Cichocki plans to use her success at Global Games as a springboard to qualifying for London 2012 at upcoming Paralympic meets and the US Trials in April. Cichocki is also a talented writer and has been chosen by INAS as one of four bloggers documenting her attempt to make the Paralympic Games (www.Inas.org). 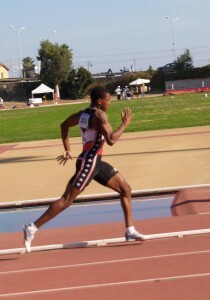 Three US athletes competed in two events. Sarah Gilbert swam four races, setting personal bests in the 200 and 400 freestyle. Most impressively, Gilbert, who also rows with the Jacksonville, FL rowing club, placed 5th in the 1000 meter indoor rowing competition and 7th in the 500 meters. With rowing slated for the 2016 Paralympic Games in Brasil, Gilbert will be a strong contender to win a seat in the US Mixed 4 with Cox boat. 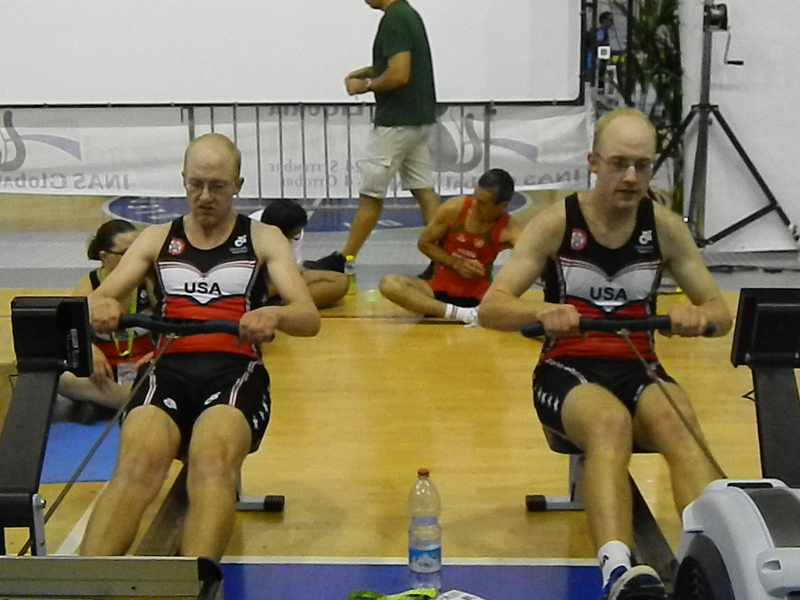 Brothers Bruce and Mark Worley warm up for the men’s 500m ergometer race. 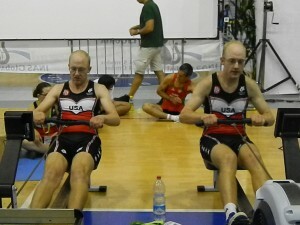 Twins Bruce Worley and Mark Worley of Columbia, MD competed in the 10,000 meter run and in the 500 meter indoor rowing race. In the 10,000 the brothers took an early lead in the race before Ukrainian Andriy Goliney ran away from the field and posted a winning time of 33:16. In the 500 meter rowing the brother performed very well with Bruce just ten seconds off the winner and Mark 15 seconds back. Both compete in open on water rowing competitions as members of the Athletes Without Limits/DC Strokes/US Paralympic Military team. The US Team coaches included Andrew Reynolds, Track and Field; Barry Holman, Swimming; Michael Lyach, Cycling; and Julie Holman, Indoor Rowing. Athletes Without Limits partnered with Champion System for all US Team technical team wear except for the swim racing suits. The team is currently seeking a sponsor to provide FINA approved swimsuits. For more information contact us.